AWS Cloud9 includes a browser-based editor that makes it easy to write, run, and debug your projects. As you type, code completion and code hinting suggestions appear in the editor, helping you code faster and avoid errors. Code completion is based not only on the identifiers within your files but also on standard libraries. The editor also enables you to fully customize your view. You can adjust your panels in any direction with a simple drag-and-drop action. AWS Cloud9 comes with an integrated debugger, which provides commonly used capabilities like setting breakpoints, stepping through code, and inspecting variables of any PHP, Python, JS/Node.js, C/C++ app. AWS Cloud9 allows you to easily build serverless applications by providing an integrated experience to get started, write, and debug serverless application code. The Cloud9 development environment is pre-packaged with SDKs, tools, and libraries needed for serverless application development. Cloud9 also supports the Serverless Application Model (SAM) so you can use SAM templates in Cloud9 to provide a simplified way of defining resources for your serverless applications. 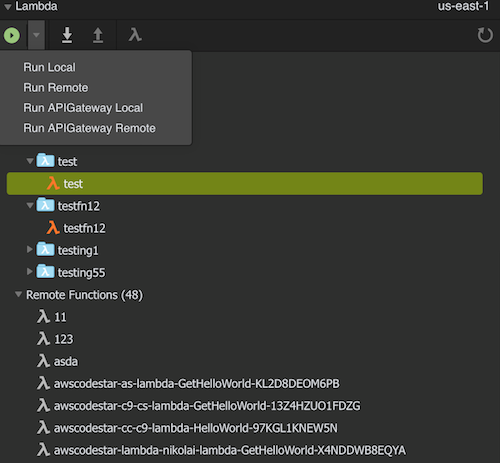 Additionally, Cloud9 allows you to edit and debug AWS Lambda functions locally, which eliminates the need to upload your code to the Lambda console for debugging. 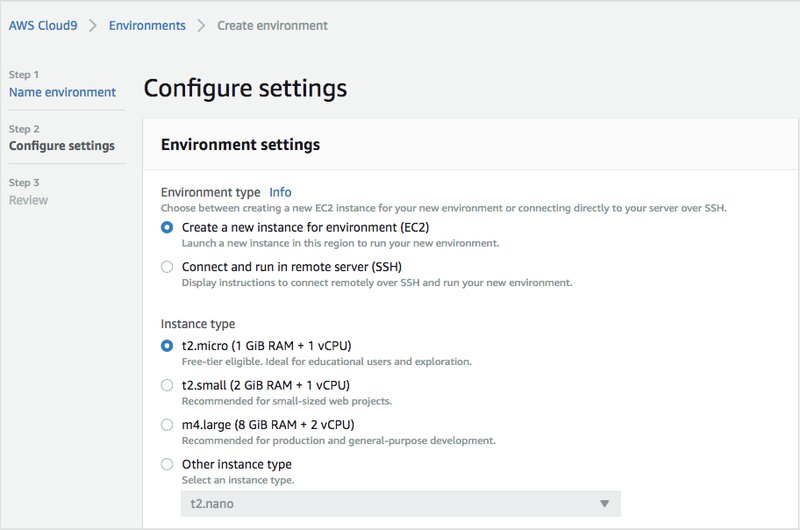 You have the flexibility to run AWS Cloud9 development environments on a managed Amazon EC2 Linux instance or any Linux server that you are using today. 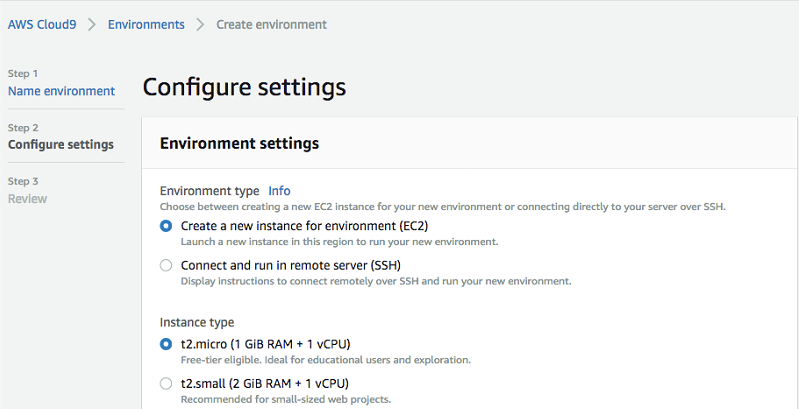 You can just choose the SSH connectivity option during Cloud9 setup when connecting to your own Linux server that could be running anywhere including AWS, on-premises, or any other cloud provider. AWS Cloud9 provides a terminal that has full sudo privileges to your managed Amazon EC2 instance. It enables you to run commands, such as pushing code changes to git, compiling your code, or displaying command output from your servers. A pre-authenticated AWS Command Line Interface is installed in your terminal, allowing you to easily control and interact with AWS services directly from the command line. 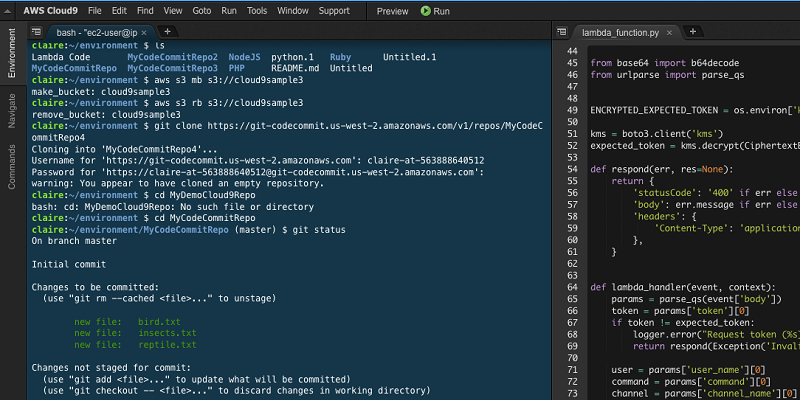 AWS Cloud9 lets you share your development environment with your team. This makes it easy for multiple developers in your team to actively see each other type and pair-program together on the same file. Cloud9 allows you to use the built-in chat capability to communicate with your team without having to leave the IDE. AWS Cloud9 integrates with AWS CodeStar, allowing you to quickly setup an end-to-end continuous delivery toolchain for your application and start releasing code faster on AWS. 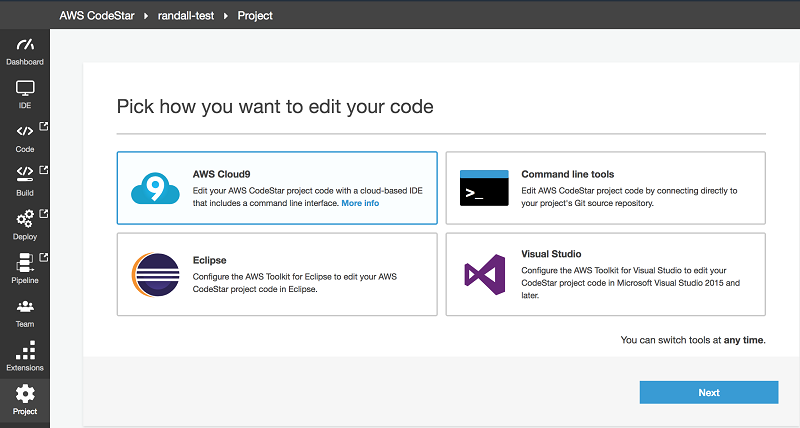 Codestar provides a unified experience that enables you to easily build, test, and deploy applications to AWS with the help of AWS CodeCommit, AWS CodeBuild, AWS CodePipeline, and AWS CodeDeploy. In a few clicks, you will be able to connect your Cloud9 development environment to a continous delivery toolchain. AWS Cloud9 keeps the revision history of the files in your development environment. This allows you to quickly access code changes that were made in the past and revert to an earlier iteration. AWS Cloud9 allows you to choose from a variety of color schemes that control syntax highlighting and the UI. You can also fully customize the Cloud9 UI by editing your stylesheet. 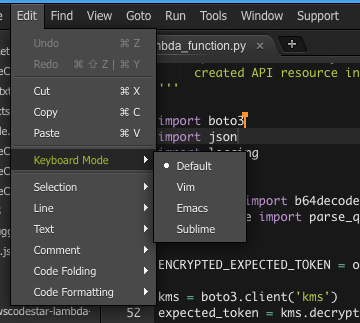 In addition to the default key bindings, AWS Cloud9 offers the choice to use VIM, Emacs, and Sublime key bindings, as well as to define your own custom bindings. This allows you to use the same commands and shortcuts you are already familiar with. AWS Cloud9 supports the ability to edit images, enabling you to resize, crop, rotate or flip the image straight from the browser.